Here is a Step by Step Guide on Setting Up WordPress Multisite on Nginx on Ubuntu 14.04 on HP Cloud with All Commands and the Configuration. So, we have no theory in this guide. This Guide, WordPress Multisite on Nginx on Ubuntu 14.04 on HP Cloud Will Be Followed By a Theoretical Article and a Screencast. The step by step commands obviously can be used by a newbie too on non-HP Cloud setup, the reader should start from third sub header in that case (Steps). In any case, you must copy the commands on your plain text editor and then copy to SSH screen. In order to getting started with WordPress Multisite on Nginx on Ubuntu 14.04 on HP Cloud, we have taken it granted, that you have done proper steps, like setting up the Router on HP Helion Public Cloud, Setting Up Ingress – Egress Policies, optionally using HP Cloud Banner as pre-login SSH screen. We always recommend to use, two server configuration. Hence, the guide for having a Separate Database Server. We will use the Subnet for internally connecting, which will not be discussed here. WordPress Multisite on Nginx on Ubuntu 14.04 on HP Cloud Demands Minimum Idea about Server Administration. You, possibly should add couple of Varnish Server in Replication to make it fail safe. We are taking it granted that, you opted to go for WordPress Multisite on Nginx on Ubuntu 14.04 on HP Cloud instead of using IP based Virtual Hosts. You will need a 8 GB instance to run WordPress Multisite on Nginx on Ubuntu 14.04 Parter Image on HP Cloud for smoothly running 10 websites with some load. Application Server can be of 4 GB, if you are using InnoDB as Engine, provided that you are using W3 Total Cache’s Database Cache. WordPress Multisite is a complicated matter, if the server fails, your nerve will fail. This WordPress Multisite infrastructure on Nginx is for managed hosting. Only exceptions of using lesser resource is either websites with very low load or all websites are yours. 2GB – 1GB configuration will be fine in that case. WordPress is written in the worst language named PHP. Nowadays, you will find PHP Experts. Fact is, if WordPress was written in Ruby or Python, we would need one 1 GB server. For the ineffective language plus WordPress, plus MySQL, it is risky; too risky to lower down your budget. With that one 1 GB server, your websites would run more faster than one 8 GB instance at frontend. An excellent project is going on to make a kind of WordPress in Python. Do you know the name? No. Your guess is wrong, you are thinking about that one which starts with “M”? No. That is running on my this Mac as localhost! I am writing that for my own need! Very meaningful line. The pathetic pain with SSL certificate installation can push you to read older docs on IBM’s website! Ubuntu is not the original UNIX. UNIX Wheel group is not present. Nginx www user be unable to find the path for SSL. mkdir -p is for ordinary works. SSH to the instance, run sudo su to become root. If sudo is throwing error like “sudo: unable to resolve host”, read it. You have a Separate Database Server. This is the bunch of commands needed to install Nginx and PH5-FPM. ## are you blindly copy pasting? are you blindly copy pasting? # are not found? lol are you blindly copy pasting? My Website 1 is abhishekghosh.net (Primary domain). This is the site that is created when WordPress is installed. My External Domain (My Website 2) is abhishekghosh.pro. dr.abhishekghosh.net is a subdomain (My Website 3). WordPress Multisite is very difficult to manage from backend on security point. We will create a new one named thecustomizewindows. `$host` variable creates separate log files for each domain. It does thing like the `cat` utility. This is why, the advanced coders get angry on PHP and WordPress. Hackers are also reading this! You have to apply a sense to give the output to the fake location /etc/nginx/sites-available/abhishekghosh at fronted. Your basic target is to stop the hacker to change your HP Cloud Account’s Password! It is normal, that you need to copy paste the real password somewhere. my.cnf can have 0.0.0.0 as Bind IP. It does not matter much on HP Cloud’s setup. 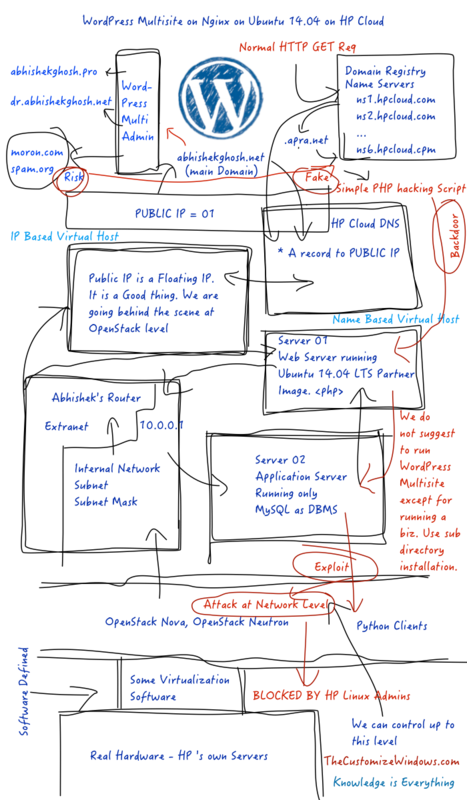 On Rackspace, as there is no visible Router, that Private IP is a bit dangerous. Again, paid Amazon is like HP Cloud. Digital Ocean is like Rackspace (minus the cost). Rackspace is worthless right now. We used Rackspace for the past 4 years. Excellent behavior. For the excellent behavior we are writing about HP Cloud! HP Cloud, IBM and the other old companies are reliable, Digital Ocean is least costly. But, on Digital Ocean, your instance can get deleted! Amazon is less reliable than HP Cloud, IBM and the other old companies. It can give a bit pain initially, but secure. Again Nginx can get only in trouble. wp-config.php is a dangerous file! That define('FS_METHOD', 'direct'); will solve upload issue. You can tighten the security by chmod value later. We need only read access to wp-admin, wp-includes except at the time of updates. A tight chmod value is better. When you’ll update, again chmod to 0777 or whatever you want. Again chmod to a tighter after the update. PHP is a great software, thats why so much precaution! Ruby would need env, Python would need env. PHP needs nothing. If you put a PHP INFO file at public root, you might get hacked. Yeah, its quite easy. Scripts are available to hack. Do not try those scripts on other’s server, even own server! Police will immediately arrive and put you inside a cage! You need a written permission only to hack your own website. Because, Cloud is Multitenant! If we did it before, we would face White Page. May be. No warranty with PHP. Unchecking the option 2 and checking the option 5 can create duplicate content issues with search engines. This is why You’ll see, self hosted websites works better in long term. Self hosted = 1 server, 1 website at minimum. The Sites > All Sites section should now show an additional ID column. Note down the ID values for each site. I wrote something there along with the others. Whatever, you might face error, you might need to edit a bit, but this way will give 95% chance to run without pain. It is very complicated to optimize FPM or FAST CGI. There is way to make WordPress WP-Admin running on different server – Move WordPress Administration to Different Server or Sub-Domain. Thats great to prevent getting hacked. We have separate guides for optimizing the parts of everything mentioned here. Your Database server is the main Server! That is the Application Server. There are all the post contents, all data. FTP server only saves the media content. Taking backup of MySQL database and WP-Content will work fine. Openstack Snapshots will be very big. Keep one Snapshot at running condition and take file level backup manually from a third server. You can ask Rackspace or HP Cloud’s support personnel as a client – whether this WordPress Multisite on Nginx is safe or not, they will ask your need. That falls among Cloud Consultancy. Do not use hundreds of Plugins if you resell. The plugins, themes for sites should be manually checked, links removed, any tracking code needs deletion. This Article Has Been Shared 5083 Times! How To Get Auth Token in HP Cloud OpenStack Swift? Here is How To Get Auth Token in HP Cloud OpenStack Swift, Which is Possibly Most Frequently Asked Question. It Will Also Work For CyberDuck. Cite this article as: Abhishek Ghosh, "WordPress Multisite on Nginx on Ubuntu 14.04 on HP Cloud," in The Customize Windows, January 13, 2015, April 21, 2019, https://thecustomizewindows.com/2015/01/wordpress-multisite-nginx-ubuntu-14-04-hp-cloud/.